Billy and Sheena have a deep-sea encounter with a dead captain and the terrifying adventure continues when they arrive in HorrorLand, a place where nightmares come true. Robby&apos;s Web comic strip character, the evil Dr. Maniac, is transported into the real world and Robby must try and catch him. "When a group of comic book characters appears in the real world, twelve-year-old Richard Dreezer must track down Dr. Maniac to save the day"--From publisher&apos;s web site. When she discovers an evil mask at the bottom of a trunk and puts it on, LuAnn&apos;s Halloween turns into a real nightmare because only an act of unbelievable kindness can remove it. Stine, R.L. /as told to Joe Arthur. It&apos;s the first day of school-- forever! Everything goes wrong for eleven-year-old Artie on his first day at Ardmore Middle School, from the moment his alarm goes off until the next morning, when everything is repeated exactly the same way. Jay Gardener is trying to stay out of trouble in his new neighborhood, but when strange things keep happening to him, he wonders if it is the lawn gnomes causing all the trouble. Stine, R. L., author, author. 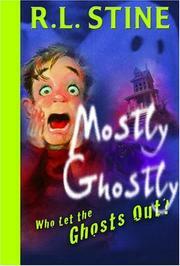 A boy suddenly finds himself haunted by the friendly ghosts of two children while being pursued by an evil being.